Find out more information about. We are the Chesterfield Branch of the Derbyshire Unemployed Workers; Centres and one of our Advisers is in the Lounge of the Somercotes Parish Hall on a Monday afternoon from 1.30 pm until 4.00 pm. We advise on a full range of benefit and credit entitlements such as Pension Credit, Disability Living Allowance, Housing Benefit, Council Tax Benefit. We recently received a grant of £13,700 from the Society for the Assistance of Ladies in Reduced Circumstances, which has allowed us to run a one-year project, which started in November 2009, to benefit older ladies who live alone and would like to receive advice from a female worker. If you are a lady who is 60 plus and are resident in Amber Valley, you can request a home visit from a female worker. Sarah Smith is currently employed on this project and has a great deal of experience in assisting older people with their benefits and credit claims. However, there is no strict criteria and if an older lady is in need to help we will ensure that she is seen - it is our policy never to turn anyone away. 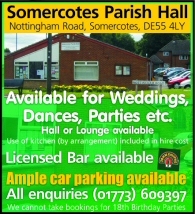 Every effort is made to keep this site up to date however Somercotes Parish Council are not responsible for any errors or omissions in the content displayed.